334 pages | 3 B/W Illus. Legal education is undergoing rapid change throughout Asia. This book is a critique of the changing nature of legal education in major Asian jurisdictions as diverse as Afghanistan, Australia, Cambodia, the People’s Republic of China, Hong Kong, Indonesia, Japan, the Republic of Korea, Singapore, Taiwan and Vietnam. It provides cross-country comparative material, including Western legal education systems, and particularly detailed coverage of Japan, whose legal education system has been used by many other countries in Asia as a model to imitate. Despite the diverse histories, societies, traditions and political and economic situations of these countries, they all share common themes of change, renewal and reform in their legal education systems. 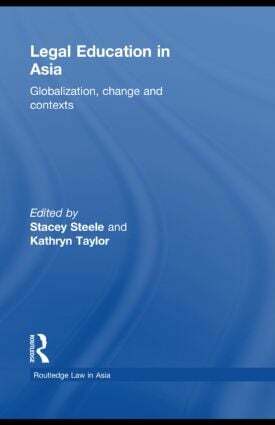 The jurisdictions also generally tend to be embracing globalisation, despite (or in some instances because of) the association of globalisation with other movements, such as the development of market economies and neo-liberal ideals. This is the first significant collection available in English on the subject of pre-qualification legal education in Asia, providing a valuable multi-jurisdictional tool for academics and students of Asian legal studies, law reformers, governance experts, development practitioners and lawyers working in the region. Stacey Steele is Associate Director at Asian Law Centre, University of Melbourne, Australia. Kathryn Taylor is the Manager of the Asian Law Centre at the University of Melbourne Law School.